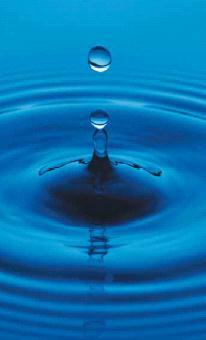 Water crosses cellular membranes to maintain osmotic equilibrium. As solute concentration in biological fluids is usually very low, in clinical practice osmolarity is used instead of osmolarity. Toldt's membrane : the part of the renal fascia anterior to the kidney. Zuckerkandle's fascia : the part of the renal fascia posterior to the kidney. pronephros / pronephron : the 2.5 mm-sized primordial kidney consisting of 6-10 pairs of tubules; a vestigial excretory structure or its rudiments developing in the embryo at 4 weeks, before the mesonephros. Although nonfunctional, its duct is later used by the mesonephros, which arises caudal to it. 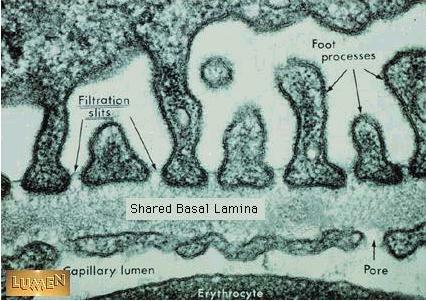 pronephric tubules : the tubules constituting the primordial kidney of vertebrates; they are rudimentary in amniotes. nephrogenic cord : a longitudinal cordlike part of the urogenital ridge , formed of fused or never separated nephrotome plates, that gives rise to the segmental or mesonephric tubules and part of the metanephric tubules. nephric blastema : the extension of nephrogenic cord tissue, caudal to the mesonephros, into which the ureteric buds grow to initiate development of the definitive mammalian kidney. metanephric blastema : the concentrated mass of mesodermal cells about the metanephric bud in a young embryo; the cells of the cap form the uriniferous tubules of the permanent kidney. metanephric tubules : the tubules comprising the permanent kidney of amniotes. phylogenesis : in all of the vertebrates, beginning from the most primitive ones, an universal principle of structural, functional and chemical organization of the nephron is noted. The main trend of progressive evolution of kidney function (both in phylogenesis of vertebrates and ontogenesis of birds and mammals) is the increase of the intensity of filtration-reabsorption mechanism of urine formation. The development of secretory apparatus is considered as an adaptation to the conditions in which this mechanism is not sufficient to provide the necessary level of excretion. It is suggested that secretory mechanism is formed in close relation to cellular system of reabsorption of sodium and chloride. The first step in the evolution of osmoregulation in vertebrates involved development of water-impermeable epithelium which depended on specific distribution of aquaporins in plasma membranes, secretion of autacoids, formation of water-impermeable cell contacts with a high electrical resistance. Migration of vertebrates to the land was associated with appearance of the ability to regulate osmotic permeability of epithelium in a number of organs involving vasotocin and other pituitary hormones, insertion of aquaporins into the luminal plasma membrane. Enhancement of the renal role in the water-salt balance, intensification of the kidney function was due to a rise in renal circulation, glomerular filtration rate, and tubular reabsorption which, despite the increase in the energy expenditure, provided for an obvious enhancement of the renal work efficiency in maintaining the constancy of the internal medium. Colonisation of desert regions became possible in birds and mammals due to development of the system of urine osmotic concentration. Unlike the accepted point of view that this depended on the appearance of Henle's loops, the statement is substantiated that the leading role in this process is played by differentiation of the kidney into the cortex and medulla, as nephron loops similar to Henle's loop have been revealed in the lamprey. In the vertebrates, the evolution shifted from the polyorgan to mono-organ type of osmotic homeostasis maintenance, with the leading role of the kidney in maintaining physico-chemical constants of the internal medium fluidsref. The presence in lamprey kidney of a loop which is similar to Henle's loop in mammals and birds indicates that the development of the system of osmotic concentration conditioned by the formation in the kidney of the medulla and from a sharp increase in renal arterial blood supplyref. While neonatal kidneys are not powerful in concentrating urine, they already dilute urine as efficiently as adult kidneys. The renal medullary tubule organization of neonatal rats shares a tremendous similarity with avian renal medulla : the qualitative changes in the organization of medullary tubules may be primarily responsible for the immature urine-concentrating ability in mammalian neonatesref. kidney / ren (nephrology) : either of the 2 organs in the lumbar region that filter the blood, excreting the end-products of body metabolism in the form of urine, and regulating the concentrations of hydrogen, sodium, potassium, phosphate, and other ions in the extracellular fluid. The kidney is of characteristic shape, and presents a notch on the inner, concave, border, known as the hilus, which communicates with the cavity or sinus of the kidney and through which the vessels, nerves, and ureter pass. It is a filter for molecules with Mr > 40-50 kDa. GAGs within the GBM prevent protein crystallization. Brödel's white line : a longitudinal white line on the anterior surface of the kidney near the convex border. outer stripe : in the outer zone of the renal medulla, the part next to the cortex; it contains thick descending and thick ascending limbs of the loop of Henle. inner zone of renal medulla : the part of the medulla farthest in from the cortex, containing ascending and descending limbs of the thin tubule as well as the inner part of the medullary collecting duct. nephron (urothelial cells) : the anatomical and functional unit of the kidney (250,000-1,200,000 per kidney; average = 1,600,000), consisting of ..
principal cells : light-staining cells of the renal collecting tubules that transport water in response to ADH and sodium in response to aldosterone . cortical collecting tubule : the more proximal parts of the renal tubule, which lie within the cortex. medullary collecting tubule : the distal part of the renal tubule, including the loop of Henle, lying within the medulla, which opens at the apex of a renal papilla. 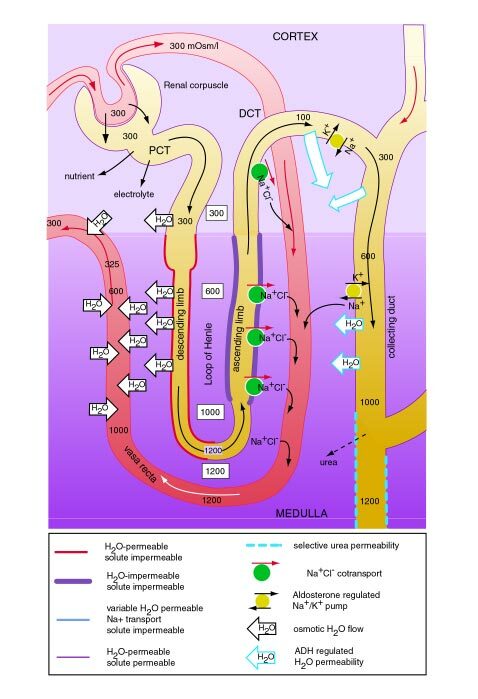 iuxtamedullary nephrons (long-loop nephrons) reabsorb most H2O. juxtaglomerular cells (JGC) / granular cells / myoepithelioid cells : specialized smooth muscle cells, located in the tunica media of the afferent glomerular arterioles and containing renin secretory granules. They are innervated by orthosympathetic fibers via b1 AR . juxtaglomerular index : semiquantitative estimation of the degree of granulation of juxtaglomerular cells, obtained by a counting method and expressed as a ratio to the number of glomeruli. terminal tract of distal convoluted tubule and cortical collecting duct : 4% (31 mEq/L). Here it can be secreted by aldosterone -dependent intercalated cells. contracurrent multiplication renders renal medulla hyperosmotic. The descending limb is H2O-permeable, while the ascending limb is H2O-impermeable. In the thick ascending limb the paracellular leakage allows a maximal gradient = 200 mOsm/kg H2O to be created : starting with an ultrafiltrate at 300 mOsm, kidney can't generate urine with less than 100 mOsm, but addition allows the medullary intersitium to reach 1,200 mOsm/kg H2O (600 mOsm/kg H2O from urea + 350 mOsm/kg H2O from Na+ + 350 mOsm/kg H2O from Cl-) = maximum urinary concentration (MUC) in humans. The gradient is maintained as vtubular output >> vtubular flow. At the level of distal convoluted tubule and in the first part of collecting duct Na+ is reabsorbed (also H2O upon ADH stimulation), hence generating further hypoosmolar urine that is reabsorbed in the deep portion of collecting duct, near the hyperosmotic interstitium. Cells within this area resist osmotic pressure as also intracellular fluid is hyperosmotic thanks to urea and sorbitol. Urea has the same movement possibilities as H2O, but with higher rate. Urea can be concentrated up to 600 mOsm (upon ADH stimulation) through a contracurrent exchange system : osmotic outflow in proximal tubule concentrates urea and then let it outflow in the deep area of collecting duct (and even before upon ADH stimulation) increasing osmolarity and partly recirculating. Both arcuated artery (300 mOsm) and efferent arteriole (400 mOsm) are H2O-permeable but the vertical interstitial gradient is not eliminated as in this contracurrent mechanism vhorizontal diffusion >> vvertical diffusion into interstitium. pend of vasa recta ~ k.
Urine : the fluid excreted by the kidneys, passed through the ureters, stored in the bladder, and discharged through the urethra (1 mL/min (1.5 mL/min in males, 1-1.2 mL/min in females) = 1 ml/hr/kg = 40-50 ml/hr = 1,400 mL/die on average: since 180 L/die preurine are filtered, a concentration factor = 180 exists); its constituents and volume vary widely from day to day in order to maintain normal fluid and electrolyte homeostasis. uricuria / uricosuria = [uric acid, monosodium or disodium urate, potassium urate, ammonium urate, calcium urate]urine = 250-750 mg/die in females or 250-800 mg/die in males. Uric acid is more soluble in urine than in water due to presence of urea, proteins, and mucopolysacchardes. 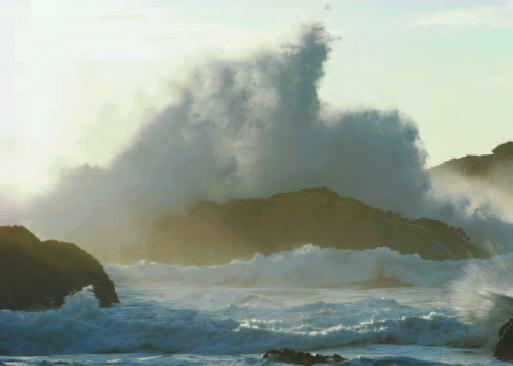 Miction / uresis / urination / micturition : the discharge or passage of urine. urine spindles : spindle-shaped, urine-filled segments of the ureter due to incomplete occlusion of the ureter during peristalsis. Küss's experiment : injection of a solution of opium or belladonna into the bladder, which produces no symptoms of poisoning and thus proves the impermeability of the bladder epithelium to these substances. musculus sphincter vesicae urinariae : sphincter muscle of urinary bladder: a circular layer of fibers surrounding the internal urethral orifice, innervated by the vesical nerve, and acting to close the internal orifice of the urethra. As urine flows in, the smooth muscle of the bladder relaxes to accommodate 450-500 ml of urine. The urine does not leak from the bladder because of 2 sphincters, the smooth muscle internal sphincter and the skeletal muscle external sphincter. The bladder is innervated by the sympathetic nervous system, which causes the smooth muscle of the bladder to relax and smooth muscle of the internal sphincter to contract, thus promoting the storage of urine in the bladder. The parasympathetic nervous system causes the bladder muscle to contract, thus promoting the emptying of the bladder. The external sphincter is under volitional control : the cerebral cortex, brain stem, and spinal cord are all involved in the process or urination. micturition reflex : any of the reflexes necessary for effortless evacuation of urine and subconscious maintenance of continence: vesical contraction following distention of the bladder, vesical contraction evoked by urethral flow, vesical contraction evoked by proximal urethral distention, relaxation of the urethra resulting from running liquid in the urethra, distention of the bladder resulting in relaxation of the external sphincter, relaxation of the proximal urethral smooth muscle by distention of the bladder, and vesical contraction related to running liquid through the urethra. paracystium : the connective and other tissues around the bladder. posterior urethra : the portion of the male urethra extending from the bladder to the bulb, and consisting of the membranous and prostatic parts. urethral lacunae of Morgagni : lacunae urethrales in the male urethra. valvula fossae navicularis / valve of navicular fossa : a fold of mucous membrane occasionally occurring in the roof of the fossa navicularis of the urethra. Brunn's epithelial nests : solid or branched glandlike clusters of transitional epithelium occurring in the lamina propria mucosae of the lower urinary tract.